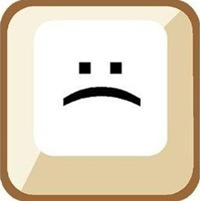 Those who have crossed the bridge to fulltime RVing will understand this post. One more item crossed off the To Do List. Garage got a major bath today. Beautiful weather made the work very enjoyable. We went to the deck after dinner tonight and the garage actually sparkled a bit. You know the feeling. Like stepping of the shower or bath after working hard outdoors. The last item on the projects for this week is to paint the trim. Can’t do that until a day or two after the garage bath. I’ll post pictures when project is done. Tonight, our daughter said she want to get started packing up the kitchen. She and our 7 y.o. grandson have been living with us for 3 years now and are moving into their own apartment this weekend. I thought I would help out a get started on this task. DW and I decided it would be easiest if we just packed all our Fiestaware and move the Corel from RV to house so we would have plates to eat off. 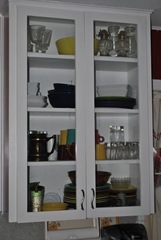 So here are before and after pictures of the one cabinet that contained the Fiestaware and glassware. As of today, we have to wash dishes after each meal since there are 4 place settings and 4 people at the table. I kept the important stuff such as wine glasses, 1 Aggie mug, and two Starbuck mugs. 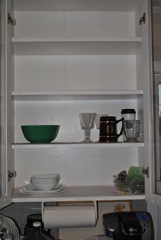 Cabinet looks a little bare. Tomorrow I hit the pots and pans. We will then get to practice cooking and eating as if we were living in the RV. After daughter and grandson move out, the house will have an echo in it and will be very empty. Sigh. Guess if all the dishes are dirty, you'll just have to go out to eat!! You're making progress. Yep; it will be very empty. And we will be very sad. This phase is the hard part! It gets stressful, but the fun is yet to come. We're out full time for our second week and all that hard work was sure worth the headache and heartache. Hang in there when it gets tough! The brass ring is within reach. It's going to seem very quiet around there for sure.Looks like you're still making great progress towards your goal. There is gold at the end of the rainbow!